OK, Part II isn’t very interesting. Really we’re all waiting for the April installment which is where we get to find out whether EFB is still menacing Copper Bee Apiary’s bees. If you missed Part I, it’s here. Anyway, Part II is about insurance. 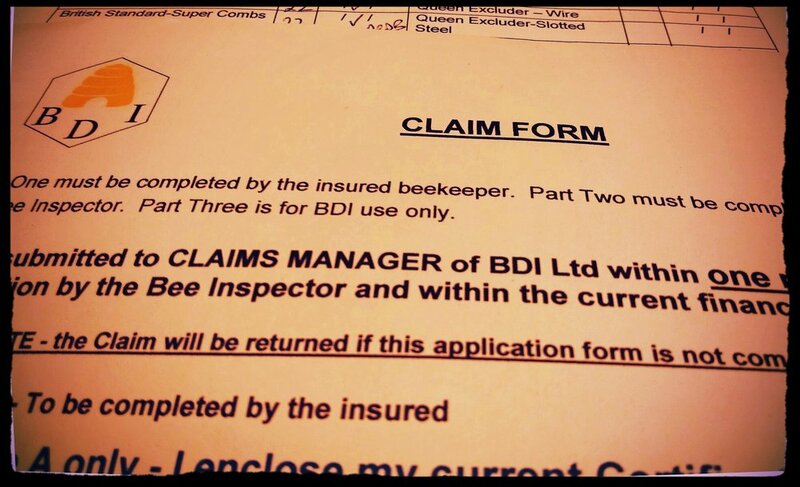 Along with membership of the Cambridgeshire Beekeepers Association (CBKA) comes bee diseases insurance (BDI), if you tick the right boxes on the application form and pay the right amount of money, which I do. My annual insurance premium is £5.25, which covers up to 10 hives. The actual replacement cost of the burned items, bought new from Thorne’s, is about twice that. That’s buying flat-pack, since buying assembled is very expensive and, for me, unnecessary. I’ll assemble it myself (that’s what Novembers are for). I will also need to replace the 11 brood frames of comb that Mab’s colony are on, since those will be destroyed after performing the shook swarm in the spring. Also on my Thorne’s shopping list are a couple of those lateral flow devices for detecting EFB. Had I had one in my beekeeping kit this summer, perhaps I would have been able to diagnose the disease myself when I first thought I saw something amiss.